Ahhhh, nothing says ‘First Day of Spring’ like a nice 3 inches of snow…am I right? If the weather has you feeling down, we’ve got a nice hot cup of white bean & parsnip soup to warm you up. On the bright side, if you love soup like we do here, at least the weather is a great excuse to get in a few last batches before it gets hot enough that eating soup makes you a weirdo. Well, unless its gazpacho. 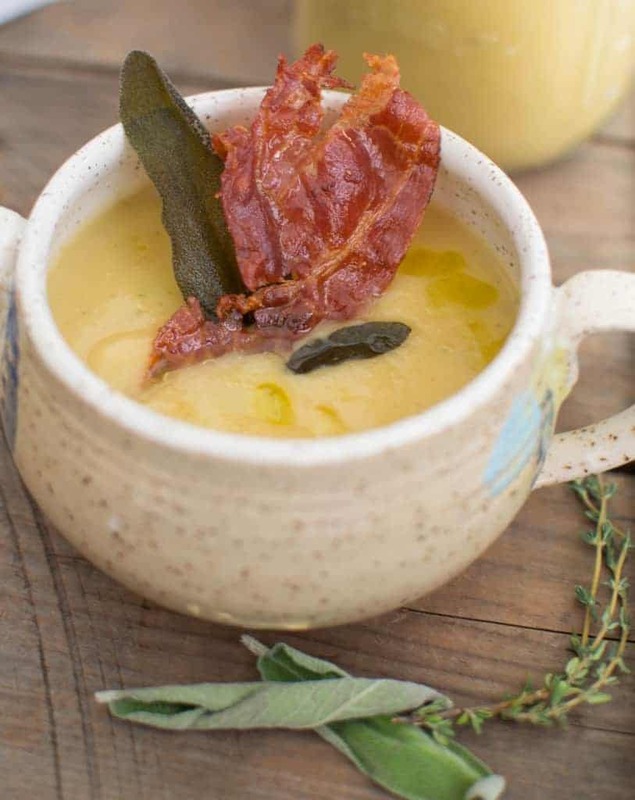 In particular, I am a big fan of bisque or purée-like soups such as butternut squash, tomato and now this soup! Not only smooth in texture, the roasted vegetables create a wonderfully smooth blending of flavors. Just enough earthy parsnip flavor, with the white beans giving it great texture, while the fresh herbs bring brightness to the palate. What is a parsnip you ask? Parsnips are a root vegetable in relation to the carrot. They are sweet, like carrots, but have more underlying root-vegetable taste – it reminds me like the earthiness of beets but just a fraction. They become sweeter when cooked or roasted. A crispy piece of prosciutto provides a salty, crunchy garnish. Don’t you love a soup that has a little bit of everything? Oh good, me tooo. The white beans will pack all the protein you need for this soup to be not just delicious, but filling too. Providing constant healthy energy throughout the day. 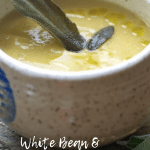 Setting flavors aside for a minute, this White Bean + Parsnip Soup is incredibly fitting for the cold rainy days of fall, blustery days of winter, or when the sun just won’t shine in Spring. The epitome of comfort food without throwing your entire healthy eating plan in the garbage. 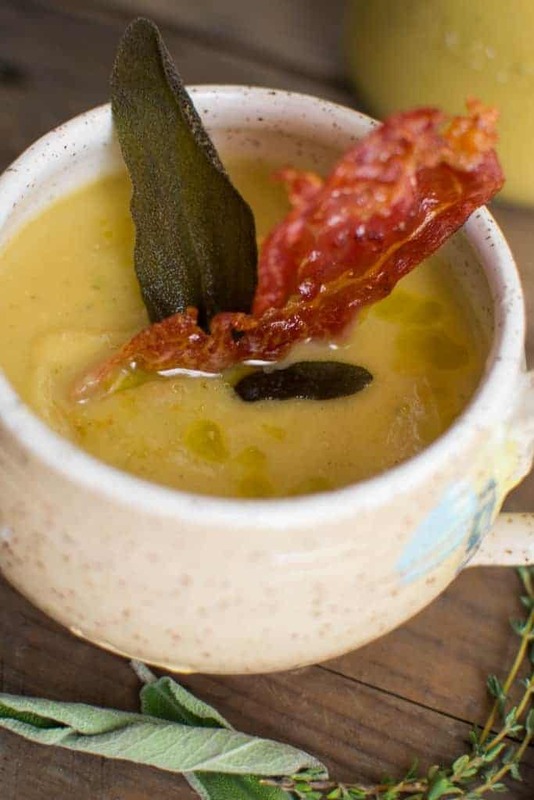 I like to think if soup could give hugs, this soup would give the best hug. Like your favorite grandma kind of hug. Bonus: It’s also customizable for a variety of diets as well. If you’re a meat eater, you can follow the recipe as is and use chicken stock. 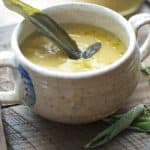 If you’re a vegetarian or vegan that chicken stock can be switched out for a vegetable stock – which is honestly my favorite variation since it cuts out calories and adds a little more earthiness in flavor. However you chose to make it, my recommendation is that you eat it all snuggled up, maybe with a few extra hugs from grandma. 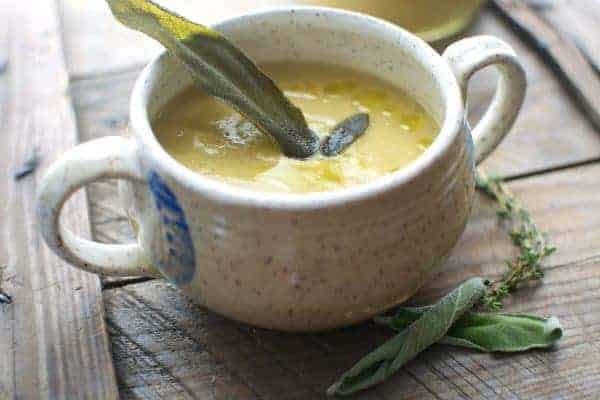 Smooth, creamy white beans and earthy, sweet parsnips pair up with fresh and bright sage for a comfort food White Bean + Parsnip Soup that’s delicious, filling and light. Preheat your oven to 400F. Peel the parsnips and cut into 3-4″ pieces. For larger parts of the parsnips, cut in half or quarters so they are all about the same size. Peel two cloves of garlic. Lightly toss parsnips and garlic with 1 tablespoon of olive oil and spread out on a baking sheet lined with parchment paper. Bake at 400F for 20-25 minutes until slightly brown and roasted. When parsnips are almost roasted, start to prepare your other ingredients. Thinly slice the leek into quarters – cut the end off the leek, cut in half horizontally and then vertical so your leek is in four long pieces. Thinly slice from there. Chiffonade 4 large sage leaves or 6 medium sage leaves. Remove the thyme leaves from the sprigs. Drain and rinse your beans and set aside. In a stock pot, heat 3 tablespoons of olive oil. Add the leeks and sauté about 3 minutes. Add the herbs and sauté 3 minutes more or until the leeks are translucent. Add the beans, roasted parsnips, roasted garlic, salt, white pepper and 4 cups of chicken stock. Stir the ingredients, reduce to medium heat and bring to a boil – about 10-15 minutes. Reduce heat to low and add the remaining 2 cups of chicken stock. Stir to combine and then blend the ingredients together using an immersion blender. If you don’t have an immersion blender just check the manufacturers guide on your blender, some will blend hot liquid and some will not – so don’t get scorched! If your blender doesn’t jive with the hots, let the soup cool before using a standard blender. You can always bring back to a simmer once you are done. Once ingredients are blended, check the salt and pepper and adjust. Depending on your texture preference, you can always add additional chicken stock to thin out the soup. If you do so, just check your salt and pepper levels after the chicken stock is incorporated. Soup is done! Put on your house pants, kick back and enjoy!